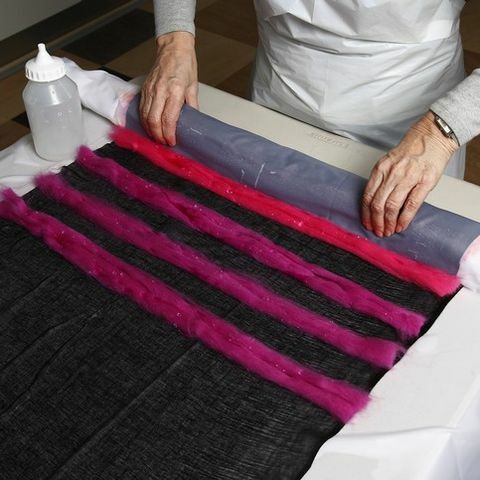 This black cotton gauze scarf is decorated with long wads of merino wool in different colours which have been placed in width from one side to the other. Then the scarf and the wool is moistened with water, rolled together and felted in the tumble dryer. 1. Cut a piece of lining fabric approx. 20cm larger on all four sides than the cotton gauze scarf and place the scarf on top of the lining fabric. Cut pieces of merino wool the same width as the width of the cotton gauze scarf. 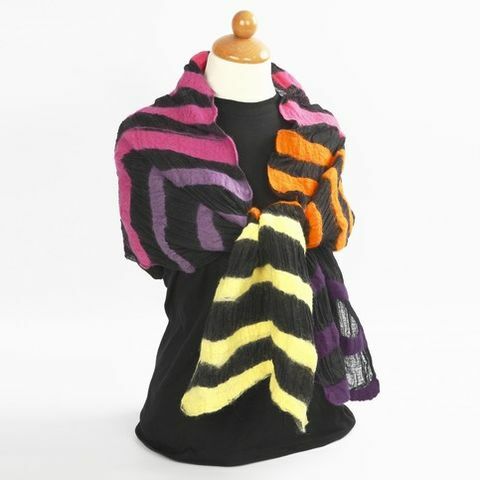 Divide each piece nto three or four lengths and place them on top of the the scarf. 2. Place a wet, rolled-up towel at the end of the cotton gauze scarf onto the 20 cm of the lining fabric that sticks out. Moisten the wool with a sprinkler bottle containing warm water. 3. 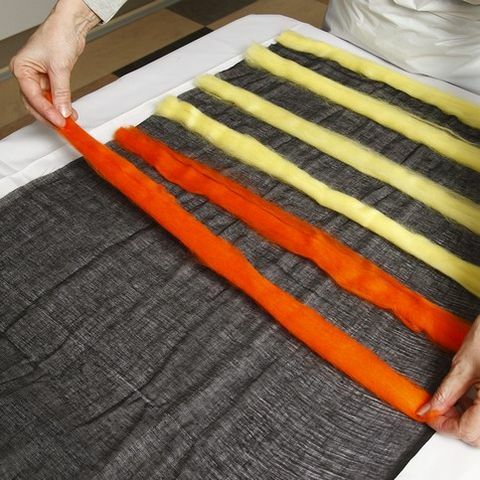 Sprinkle the lining fabric, the cotton gauze scarf and the wads of merino wool with water and roll the whole thing around the wet rolled-up towel in that order as you progress. 4. 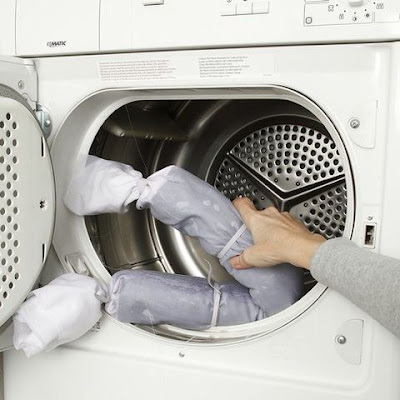 When all is rolled around the towel, tie pieces of elastic cord around both ends and add another two or three pieces to hold the roll together. 5. Now place the wet roll in the tumble dryer on a normal drying setting for approx. 30 minutes. 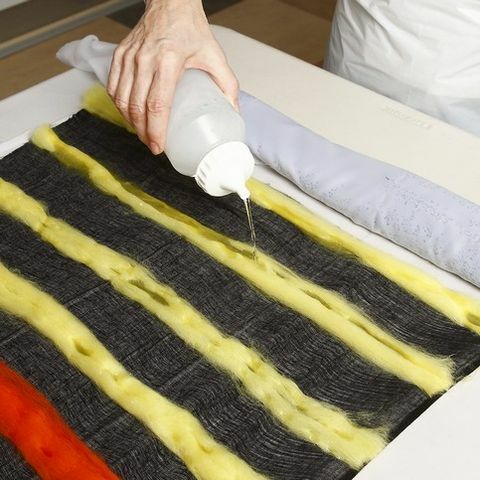 This process makes the wool felt together – and onto the cotton gauze scarf. 6. Unfold the roll and pull the decorated scarf off the lining fabric. 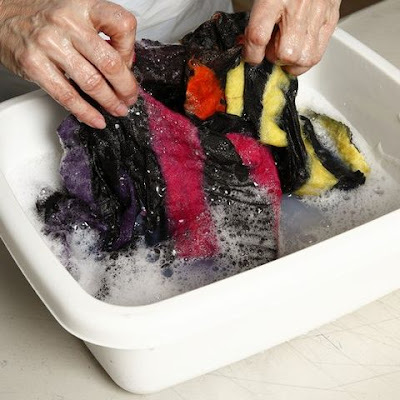 If the wool is not felted onto the scarf, repeat the process of moistening with water, roll togehter and tye together with pieces of elastic cord before putting the whole ensemble back into the tumble dryer. 7. Fill a tub with warm water and dissolve some soap flakes in the water. Rinse the scarf and squeeze the water out. 8. Hit the rolled-up scarf onto the table to get the wool to felt securely onto the scarf and to make the shrinking of the wool just right. Then rinse in three lots of cold water and add a bit of vinegar in the final rinse water to ensure that all the soap is rinsed out. Lay the scarf flat to dry. You may place it on top of a dry towel.